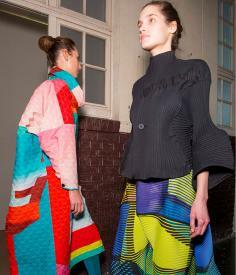 Mood board: There’s something universally uplifting about a Issey Miyake show. Models walk serenely along the runway, strolling at times in pairs, intersecting as if pacing down a pavement. The technically crafted ensembles bounce and undulate with their bodies. Despite the incredible industrial prowess used to design the brand’s garments, there’s a spontaneity behind their forms and bold textures. The ‘Dough Dough’ fabric which creative director Yoshiyuki Miyamae debuted last season can even be moulded according to the will of the wearer. It also featured here in an opening section of grey, blush pink and turquoise coats with scarf details which could be folded dependant on the wearer’s fancy. Elsewhere, dresses and trousers with angular scalloped hems were imagined in black or swathes of panelled colour, and blouses were formed from a tessellation of triangular forms, like the brand’s Bao Bao bags. Scene setting: The brand chose the Lycée Carnot for the show venue. The public secondary school is one of the most prestigious in France, and under its glass-roofed interior, models walked a catwalk floor lined with bright sports hall floor markings that emphasised the prismatic shades in the collection.